In the Louvre, collected the best works of art, pleasing visitors unsurpassed skill. 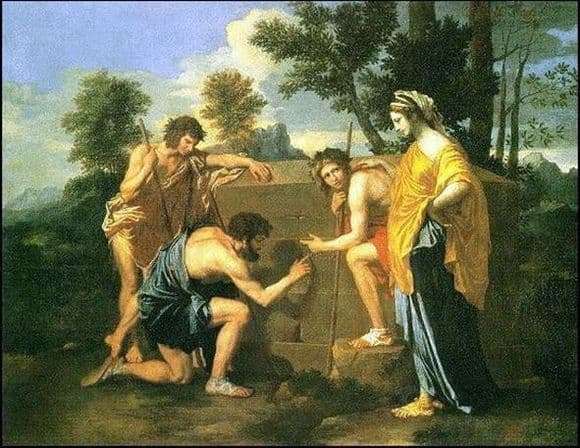 The picture of Nicolas Poussin “Arcadian Shepherds” for 20 years was closed from prying eyes and only after the acquisition by the museum (1685) became its decoration. An oil painting draws attention to the idyllic landscape, bright colors, compact composition and philosophical depth. The inscription is dual in meaning. “I” – death, which is inevitable or is it about the deceased, who found peace in a serene country? The shepherds are at a loss, the youngest of them looks at the woman with incomprehension and surprise, doubting that he will become dust. The woman’s hand rests on his shoulder, as if soothing, although her gaze is on the reader. Attention is drawn to the shadow that his hand casts. She looks like a stylized image of death, invisible soaring on the ground. So, we have a life cycle, the beginning of which was laid by a woman, and the end is an inevitable death. Between the two events a life full of hope, inner strength, bright colors passes. Not by chance a young shepherd in a red cape. Gradually, the fire of youth is replaced by measured maturity and more restrained colors. Truly, the whirlpool of life.